Earlier in the year, I started playing around with MongoDB using .NET and wrote up a Getting Started guide. Now it's Riak's turn. Riak is a distributed, schemaless, data-type agnostic key-value "NoSQL" database written primarily in Erlang. Check out the "What is Riak?" page on Basho's wiki. Install the latest custom .deb package, as per the Basho guide. Before you start Riak up, you need to tweak the configuration in Riak's app.config file. Follow the Basic Cluster Setup guide, but note that when you update the IP address for the http interface per those instructions, also make the same change to the pb_ip config value - this is for the Protocol Buffers interface. For performance, I wanted to use the Protocol Buffers interface instead of the HTTP REST API and had some initial problems as the pb_ip configuration was still set to 127.0.0.1. You then need to edit vm.args, per the setup guide. If all is well, it will respond with "pong". Now, back in the comfort of Windows (my Linux-fu is seriously lacking) we're ready to get going. There is no official .NET client library at time of writing, but Basho list a few community contributed projects. When I first looked, only 2 were listed and these appeared to be inactive with no updates since last year. It was a bit disappointing to see the lack of support for those of us in the .NET world. I then discovered CorrugatedIron, very hot-of-the-press, under development by OJ Reeves (Twitter | Blog) and Jeremiah Peschka (Twitter | Blog). The simplest way to get everything you need to get going is via NuGet. NuGet. It's a Visual Studio extension that you can download from here. Once installed, fire up VS and create a new .NET 4.0 Framework project. 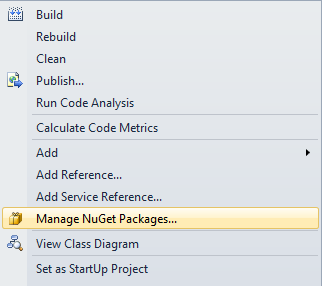 Then in the Solution Explorer, right click the project and select "Manage NuGet Packages...". In the dialog, search online packages for: CorrugatedIron. Click Install, and it will download all the assemblies/dependencies you need. When it's finished, you'll see you have references to CorrugatedIron, Newtonsoft.Json and protobuf-net. Fingers crossed, and you will get a successful response! From here, you can start playing around with Riak from .NET and find your way round the client. CorrugatedIron is still very new, so keep an eye on the site and/or on the GitHub repository. Give it a whirl, and be sure to let the guys know how you get on - I'm sure they'd be keen to hear from those using it and the project deserves support from those of us in the .NET world. It's useful to have some form of GUI over Riak so you can actually "see stuff". I've been using Rekon which I found useful to get up and running with Riak. See the download/install instructions on it's GitHub repository page. Hopefully, this post will help anyone else wanting to give Riak a try from a .NET perspective!